When cells go astray and stagger toward malignant fates, they leave behind the molecular equivalent of footprints. Some of the most telling footprints may be found along transcriptional pathways, but if the missteps are to be identified, they need to be distinguished from all the other molecular traces criss-crossing the well-trod transcriptional landscape. Recent advances in identifying and validating transcriptional oncomarkers were described at the Oncology and Biomarkers Summit, which took place recently in Atlanta, GA. As the name of this event indicates, tumor biomarkers of various kinds were on the agenda. Speakers at the event even discussed biomarkers for diseases other than cancer—neurodegenerative diseases, for example. Nonetheless, the event emphasized tumor biomarker developments that involved RNA sequencing. Bakhos Tannous, Ph.D., associate professor of neurology at Harvard Medical School and director of the Interdepartmental Neuroscience Center at Massachusetts General Hospital, discussed the potential use of tumor-educated platelets (TEPs) for pan-cancer, multiclass cancer, and companion diagnostics. TEPs, Tannous insisted, could enable clinical advances in blood-based liquid biopsies. Blood platelets, circulating anucleated cell fragments that originate from megakaryocytes in bone marrow, have established roles in hemostasis and wound healing. Blood platelets act as “local and systemic responders” during tumorigenesis and cancer metastasis. 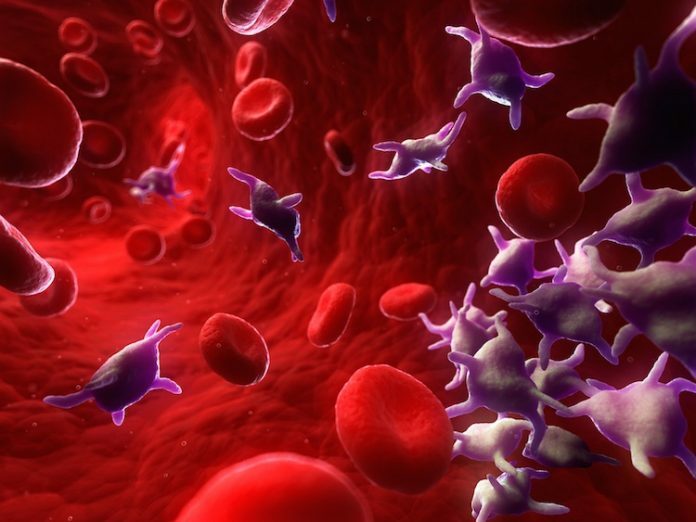 When blood platelets play this role, they are exposed to tumor-mediated platelet education, which causes the platelets to alter their behavior. Tumor cells can transfer mutant RNA into blood platelets in vitro and in vivo, creating so-called TEPs. Blood platelets isolated from glioma and prostate cancer patients, for example, contain the cancer-associated RNA biomarkers EGFRvIII and PCA3, respectively. Additionally, the gene-expression profiles for platelets taken from glioma patients are distinct from the gene-expression profiles for platelets taken from normal control individuals. Because platelets are easily accessible and isolated, they may provide an accessible diagnostic platform, Dr. Tannous and colleagues argued in Cancer Cell.1 Platelets can sequester RNA released by tumor cells and are thus an attractive source for the noninvasive assessment of biomarkers. “Further, our lab showed for first time that blood platelets carry tumor-derived biomarkers and specific gene signatures that can distinguish patients with localized and metastasized tumors from healthy individuals,” Dr. Tannous said. Tannous noted that platelet RNA profiles are affected in nearly all cancer patients, regardless of the type of tumor, although the abundance of tumor-associated RNAs appears to vary among cancer patients. In addition, surrogate RNA onco-signatures of tissue biomarkers—also in 88% of localized KRAS mutant cancer patients, as measured by the tumor-specific and pan-cancer SVM (support vector machine)/LOOCV (leave-one-out cross-validation) procedures—are readily available from very small amounts (100–500 pg) of platelet RNA. As whole blood can be stored up to 48 hours at room temperature prior to isolation of the platelet pellet, while maintaining high-quality RNA and the dominant cancer RNA signatures, TEPs can be more readily implemented in daily clinical laboratory practice, and could potentially be shipped prior to further blood-sample processing. A team of scientists led by Carlos S. Moreno, Ph.D., associate professor, Department of Pathology and Laboratory Medicine and Department of Biomedical Informatics, Emory University School of Medicine, identified several genes correlated with prostate cancer progression. These genes were used to devise a novel 24-gene signature, Sig24. Moreno said that Sig24 is distinguished from other signatures in that it encompasses genes from many different biological pathways, while other tests, such as Myriad’s cell cycle gene test, focus on specific gene sets. Thus, Sig24 analyzes more than one aspect of the tumor, a capability that may make the test more robust. Sig24 scores were calculated from previously collected gene-expression microarray data from the Cleveland Clinic and the Mayo Clinic. Sig24 performance was determined using time-dependent C-index analysis, Cox proportional hazards regression, and Kaplan–Meier survival analysis. The study findings show the applicability of Sig24 for the prognosis of metastasis or prostate cancer–specific mortality after radical prostatectomy. Future studies investigating the combination of Sig24 with available prognostic tests may provide new approaches to improve risk stratification for patients with prostate cancer, the authors noted. “One thing that’s different in our test is that we developed it using a diverse patient population in the initial design and discovery phase. In that sense this test, in comparison with others, may be more useful for African-American patients,” Moreno asserted. He also noted that Sig24 could be combined with other tests encompassing more markers. “The more validated prognostic information one has, the better,” he insisted. Moving beyond RNA profiling, investigators have developed techniques that allow direct visualization of RNA biomarkers in their native morphological context. The spatial resolution provided by RNA in situ hybridization (RNA ISH), proponents say, affords precise localization of target RNA in single cells and localization and quantitation of RNA expression, enabling direct mapping of RNA biomarkers to specific cell types in tumor tissues. Several companies are developing RNA ISH technology. One such company, Advanced Cell Diagnostics (ACD), was acquired by Bio-Techne in 2016. ACD’s RNAscope assay platform embodies the company’s unique probe system, Z probes. According to ACD, Z probes minimize off-target binding and increase sensitivity and specificity. The assay can be performed on a wide variety of sample types including FFPE tissues, fresh-frozen or fixed-frozen tissues, peripheral blood mononuclear cells, and cultured cells. It allows for detection of multiple RNA markers that can be visualized with either fluorescent or chromogenic labels. The second key feature of the RNAscope technology is signal amplification. “After hybridization with the target RNA, each Z pair creates a binding site at the upper portion of the Z pair for the signal preamplifier to bind,” Anderson detailed. “Each preamplifier can bind multiple amplifiers, and each amplifier can further bind multiple labeled probes, sequentially hybridizing to assemble a branching complex at each ZZ binding site. Labeled probes contain either a chromogenic enzyme or a fluorophore that generates a signal detectable under a standard bright-field microscope or fluorescent microscope. The RNAscope technology is automated on the Leica’s Bond and Roche’s Ventana Discovery slide staining instruments for FFPE tissue. For downstream data analysis, specialized third-party tools such as Indica Labs’ Halo software or Leica’s Aperio RNA ISH algorithms are available. Such tools can extract quantitative information from RNAscope-generated images. Several published applications support the potential clinical utility of RNA ISH technology as embodied in RNAscope. Rohit Mehra, M.D., clinical assistant professor of pathology at the Michigan Center for Translational Pathology, noted that he and his colleagues recently identified SChLAP1, a long noncoding RNA (lncRNA), as a novel indicator of outlier expression in a subset of prostate cancers. This pattern of gene expression is associated with tumor cell invasion, metastasis and lethal disease. Mehra and his colleagues explained that profiling the transcriptomes of over 100 prostate cancer tissues and cell lines revealed that about 20% of RNA transcripts in prostate cancer represent novel, uncharacterized lncRNA genes. From this set, 121 candidate lncRNAs were nominated for further investigation. One of these candidates was renamed SChLAP1, and in the cohort studied, RNA ISH for SChLAP1 effectively stratified patient outcomes by predicting more rapid recurrence and clinical progression to metastatic disease (defined by a positive bone scan), and by predicting prostate cancer-specific mortality. Finally, these novel technologies, investigators say, could be used as complementary assays to further predict the course of disease and in designing personalized therapies. Mehra and colleagues envision an ISH assay for SChLAP1 that could be combined with serum prostate-specific antigen and Gleason score for risk stratification early in disease management. Such an assay could impact clinical decision-making for patients suffering from prostate cancer. 1. M.G. Best, et al., “RNA-Seq of Tumor-Educated Platelets Enables Blood-Based Pan-Cancer, Multiclass, and Molecular Pathway Cancer Diagnostics,” Cancer Cell 28(5), 666–676 (November 9, 2015). 2. C.M. Anderson et al., “Fully Automated RNAscope In Situ Hybridization Assays for Formalin-Fixed Paraffin-Embedded Cells and Tissues,” J. Cell Biochem. 117(10): 2201–8, (October 2016). 3. K.L. Pellegrini et al., “Evaluation of a 24-Gene Signature for Prognosis of Metastatic Events and Prostate Cancer-Specific Mortality,” BJU Int. 119(6): 961–967, (June 2017). 4. R. Mehra, et al., “A Novel RNA In Situ Hybridization Assay for the Long Noncoding RNA SChLAP1 Predicts Poor Clinical Outcome After Radical Prostatectomy in Clinically Localized Prostate Cancer,” Neoplasia 16(12): 1121–1127, (December 2014).